The statement “never judge a book by its cover” is true because most people don’t stop at the front cover – they continue reading the back cover to see if it grabs their interest. However, we live in a new era where almost 70% of all books are now purchased online (meaning Amazon). This new reality means that your back cover copy is more important than ever before. When people view a book online, they usually see just a tiny picture of the front cover and the first few sentences of back cover copy. This fact should give authors and publishers a great deal of trepidation. Why? People are deciding whether or not to purchase books based on a tiny picture and a few words of text you create. Before books were sold online, people walked into a store, picked up a book with their hands, looked at the cover, flipped it over and read the back, then opened the book and read a few pages. Those days are long gone. If you want to sell more books online, you need a good cover. But, you also have to grab people’s attention and make them want to read your book with just a few precious sentences of marketing copy. The stakes are higher than before, which means you need to get really good at writing back cover copy. Those words may be all that anyone sees on your Amazon page to convince them to buy your book. Start your back cover copy by displaying an attention-grabbing hook in the form of a statement or a question. Use a large bolded font to make the hook obvious to readers and separate from the other text. If you’re new to the idea of creating a book hook, use my popular “What if I told you?” technique for help. In the first paragraph under the top marketing hook, use 1 – 3 sentences to explain the big problem in society and the need for your book to exist. What is the big problem you’ve noticed that is affecting thousands of people? What are the consequences people are experiencing? Don’t get too dark or negative. But, describe the burden that led to the need for a book to be written. The final step is about creating credibility in the reader’s mind. Why should people listen to you? Beneath your 4 – 5 payoff statements, finish your back cover copy by using 2 – 4 sentences that provide a brief bio in a manner that explains why you’re worth trusting. List academic credentials, bestseller status, and describe a track record of helping people experience the payoff results described in Step 3. That’s it. Follow those four steps and you’ve got effective back cover copy. However, keep mind that the small size of paperback books and Amazon’s product pages will limit your word count to a small amount (typically 150 – 250 words.) Brevity and punch are essential to making back cover copy effective. Just like non-fiction titles, start your back cover copy with a strong hook sentence in the form of a statement or a question. Make the hook text stand out at the top. Pick the most suspenseful scene form your novel and form a short hook around the emotion felt by the main character. Make sure people can feel a sense of fear, desire, or heroism. Otherwise, your book hook will be a dud. Below your hook, give an emotional summary of the most suspenseful part of your novel. People buy fiction based on emotion rather than logic, so it’s counterproductive to give a boring synopsis of the entire plot. Instead, describe the most gut-wrenching scene using as much emotion as possible in 200 words or less. Build the description to a climax and then leave the reader hanging. Avoid giving away a spoiler, but create a cliffhanger effect and tease the reader to want to know what happens. Even though most books are now purchased on the Internet, never forget that you’re selling to people. People make decisions based on the language they read. Technology doesn’t sell books. Social media doesn’t sell books. Language drives the book sale. If you want to sell more books, start by hooking people with your back cover copy. 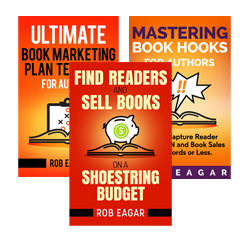 Learn how to write awesome back cover copy and other essential book marketing skills by taking my Book Marketing Master Class. Open to authors of any level and publishers of every size. Your advice is priceless and extremely sensible. I am a co-author of an upcoming self-help and motivational book called Your New You After 65.